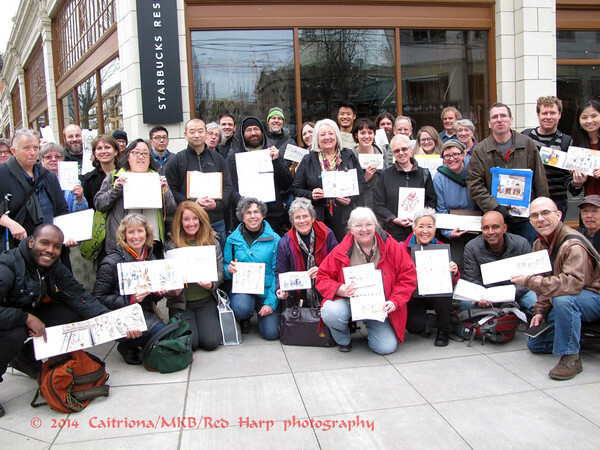 Urban Sketchers Seattle: What a crowd! Though the new Starbucks Roastery on Capitol Hill was quite full of people, it wasn't the crowd with a line out the door and down the block we'd be warned against. The Crowd today was the number of sketchers. We were combined with a few people from Stephanie Bower's workshop. The group was around 40. 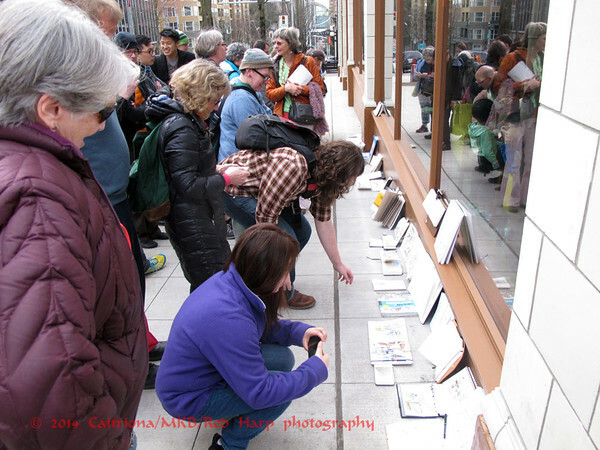 It was hard to count with everyone moving in and out to look at sketches. 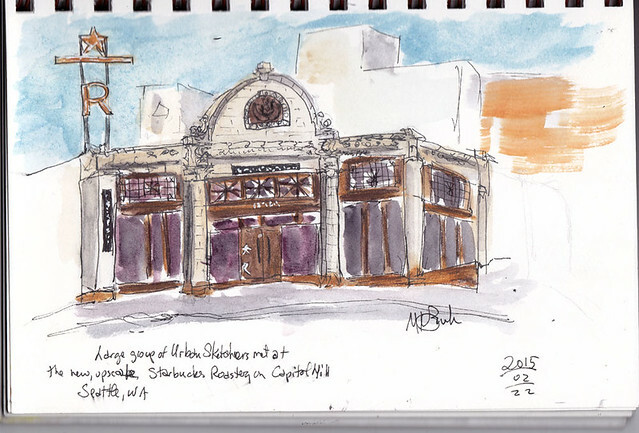 I'd previously sketched inside the Starbuck's so today I sat next to the window and sketched the McMenamins Six Arms and the street up to the dome and facade of the First Covenant Church. 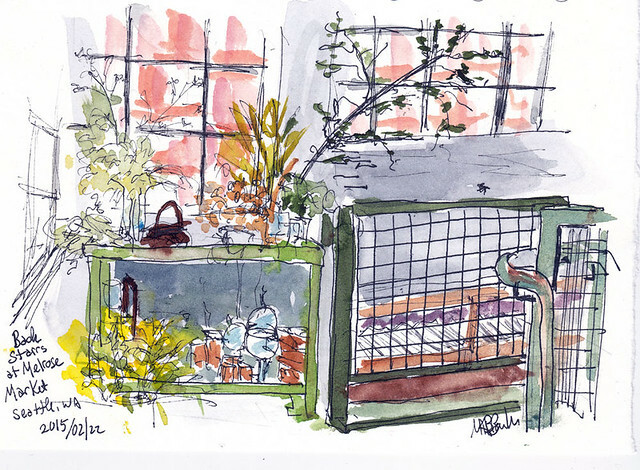 My plan for the main sketch outing was Melrose Market, as I've never been there. However, by the time I got there, I was quite full of sketchers! I found this quiet corner at a back stairs. The cart had what appeared to be old arrangements and containers. The day was sunny and 55 degrees. I learned later that the wind chill in my home town area of Michigan was minus 24 degrees! I'm glad to be here. 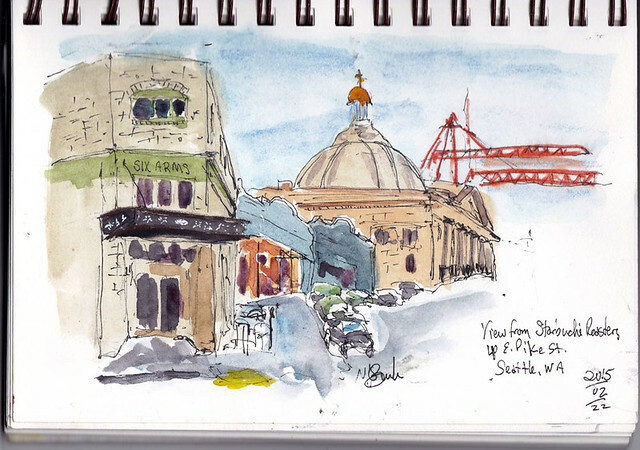 I sat for a few minutes outside on the street to sketch the facade of Starbucks. 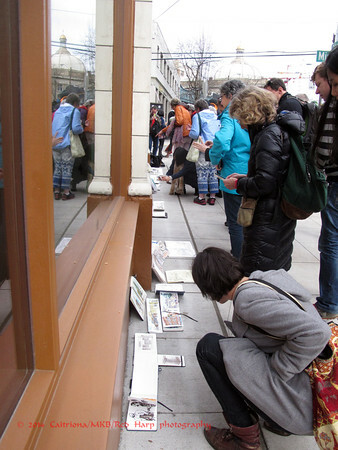 By 1:30pm, Starbucks was too full to find a table big enough to share our sketches. So we lined them up along the outside of the building. They extended nearly half way down the block! Great collection of photos, Kate. Your post sums up the whole experience very well.